a 'Bullet Fee' for the return of the body similar to those applied to executions? Due to the difficulty of performing research on this topic, all the sources cited in this answer derive from anti-government sources, as the extent of censorship in China makes it very difficult, if not impossible, to obtain information from official sources. While it is impossible to prove that nobody executed during the 1989 Tiananmen protests had bullet fees charged to their relatives, it is unlikely that any such cases existed in a verifiable manner, due to there being no mention of incidents in 1989 from multiple anti-governmental secondary sources. If such a case existed, it would reasonably be widely communicated as another example of governmental brutality. That being said, however, the bullet fee practices of the Chinese government have been well documented by various sources, most cases of which occurred during the Cultural Revolution period. For example, this article from the Hong Kong based Epoch Times cites a number of cases where a bullet fee was charged to relatives, none of which occurred in the vicinity of the 1989 protests. The tone of this article clearly shows that the writer is anti-government, and therefore is unlikely to omit cases of bullet fees being charged during the 1989 protests that were known to him. Since antiquity, during the execution of criminals, no log fee was charged for burning, no electricity fee was charged for the electric chair, no gas or poison fee charged for lethal injections and gassings, nor were knife or rope fees charged for beheading and hanging. 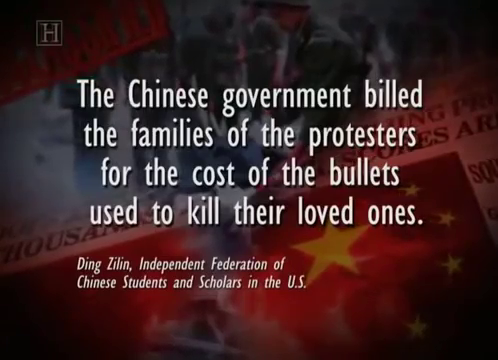 The monstrous logic birthed from Chinese Communist Party (CCP)'s culture resulted in the absurd creation of the bullet fee, adding another line to the inhumanity of the CCP's culture. In the 21st century space age, the CCP still violates human rights with impunity. This would certainly be viewed with horror by people from the future. 1967 March 23 ，劉文輝 (Liu Wen Hui) was executed in Shanghai for being a counter-revolutionary, and his family was charged a bullet fee of 40 cents. 1968 April 29, 林昭 (Lin Zhao) was executed in Shanghai and her family was charged a bullet fee of 5 cents. 1970 March 5, 遇羅克 (Yu Luo Ke) was executed for being a counter-revolutionary, his parents were charged a bullet fee of 13 cents. The bullet fee was not charged because his cornea was sold in a corneal transplant operation. 1975 April 4, 張志新 (Zhang Zhi Xin) was executed by exsanguination and shooting. His family was charged a bullet fee of 10 cents. 2006 November 28, 陳滔 (Chen Tao) was executed for rioting and killing a policeman. His family was charged a bullet fee of 50 RMB. None of these cases occurred near the time period cited. Therefore, while I cannot show conclusively what the Chinese government's bullet fee policy was during the 1989 protests, there are records of them charging a bullet fee for execution by firing squad before and after that period. Not the answer you're looking for? Browse other questions tagged politics china .